Tyson Fury is sure he will steal the show at Windsor Park on Saturday night. 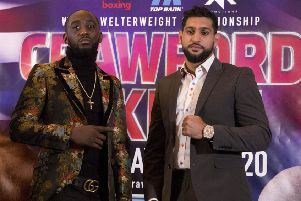 The heavyweight will face Francesco Pianeta in a warm-up before he challenges WBC champion Deontay Wilder for his World title later this year. Fury weighed-in at the Europa Hotel in Belfast yesterday and he says his fight will be one that Belfast fight fans will remember for a very long time. “It’s the Tyson Fury show. People know what they’re going to get when they come to one of these things and they like it. “If I’m coming back and setting an example, being a role model, then there’s no need for all the animosity between fighters. “I believe that nowadays you can put on a good fight without wanting to kill each other. “I’ll pray for Pianeta. I pray he produces his best performance on the night. I don’t want to hurt Pianeta. “I don’t want to do anything bad to him – I just want to beat him on Saturday night. “I hope he goes home to his family lovely and safe. That’s just the man I am. I don’t wish harm on anybody. I’ve got no enemies and I don’t hate anybody. “I like to put on a show. I like to do it. It’s entertainment. “Yes, I suppose it’s entertainment. And Wilder who was at the weigh-in yesterday says the fight with Fury is the one he wants. “Fury has to do what he needs to tomorrow so that when we come to fight, that’s how much excitement and aggression there will be. “I have no words for Anthony Joshua, it’s solely on Fury. Joshua is old news, there’s a new kid in town - Tyson Fury. “He is the true champion on this side of the pond. And now he’s going to face the lone and reigning champion, the WBC champion, the king, the man, the legend, the bronze bomber and it’s going to be a great fight,” added Wilder.